This woman is so incredibly funny (just read her Twitter feed) and she looks gorgeous from almost any camera angle. And that British accent. She’s poised and she sounds intelligent. /me sighs. I was almost sad when I found out that she very likely has a long-term boyfriend. She just has a face and personality that said she’s meant to be a lesbian, you know. Then again, I’d be equally sad if she was with a girl, but I’d get over it eventually, because she’d be an excellent advocate for all the lesbians in the world. Much like Ellen and Portia. I mean, no one actually knew that Portia was gay, right? And the next thing you know, she’s happily married to Ellen for many years now (something I blogged about months ago). My crush on her is so deep that I keep refreshing all the social network feeds through the day just to read what she has been doing and see her latest photos. She’s the first person I want to read about and the last person I want to see before I sleep. No wonder, I’m still single. Right?! My daily quota for Jaime is limitless. I just can’t get enough of this really hot woman. I first noticed her in Dexter and thought “Wow!” Then I saw her again in Warehouse 13 followed by The Finder and thought “Wahey!” Then I realised she’s in Spartacus: Gods of the Arena and Defiance too and I was like “Woohoo!” /me is high on beauty. So yes, I do think she’s perfect in every way. I so want a life partner like her! That’d be my idealistic dream and lusty fantasy come true. Make it happen this year, Universe. I’m right here waiting. For Jaime-lite. Hahaha! Here’s a few more treats for you (but mainly it’s for me). Jaime was at Dragon Con signing autographs for her Defiance fans, when her devoted nerdsbians presented her with a crown, sceptre and dragon’s blood (which is really liquid soap, I think). She was so touched that she decided to wear the crown and carry the sceptre all the time whenever possible. How super adorable of her, right?! 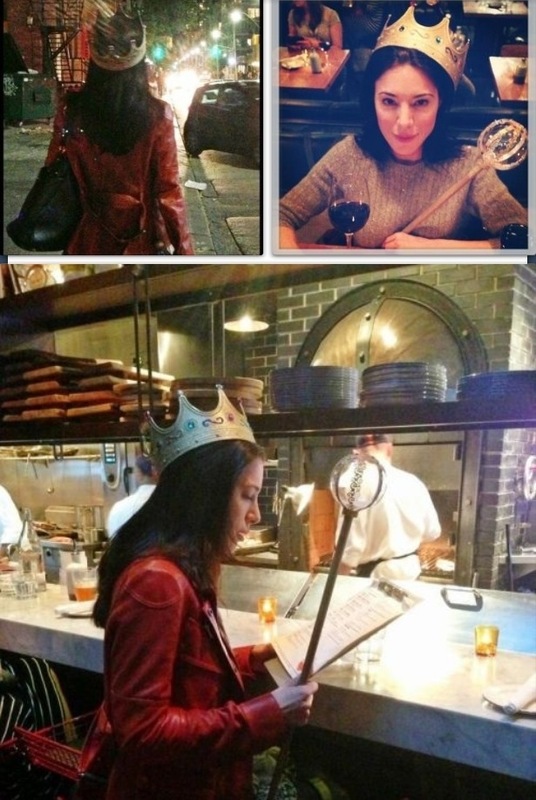 True to her word, Jaime wore the crown and carried her sceptre out to dinner with her best friend Julie Benz (another hot woman) weeks later. I haven’t stopped swooning since I started writing this blog post. Sigh.